I never make mac n cheese at home. I don't think I trust myself not to add more cheese than white sauce and not to eat it all from the pan. There's no sharing when it comes to mac n cheese, its got to be unadulterated and extremely decadent. 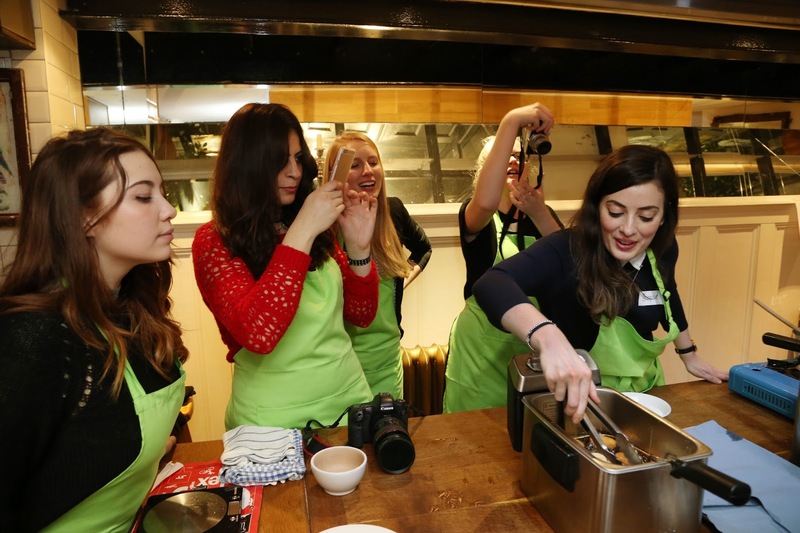 So when Lactofree invited me to a masterclass hosted by Anna Mae's to learn how to make their lacto free version, I was a little sceptical to say the least. But I love Anna Mae's and I genuinely love Arla's Lactofree range so was convinced to give it a try. A little background aside, a few years ago I suffered problem skin. Along with a few treatments and some changes to my diet, I'm pretty much over it. And Lactofree milk was the most obvious improvement for me. So any way to reduce some of the triggers in my diet has got to be good. Aka let's eat all the mac n cheese and still have lovely clear skin! 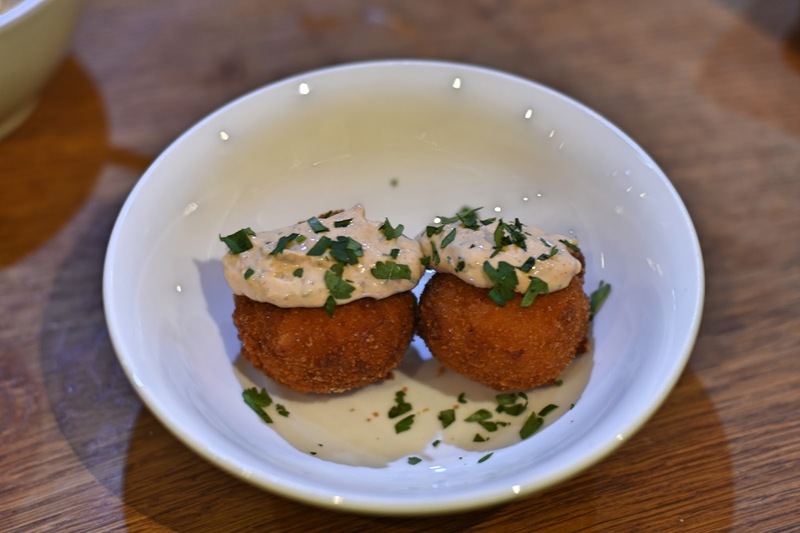 On the menu for the evening was mac n cheese topped with beef short rib and pickled red onions; deep fried mac n cheese balls with chipotle mayo; and doughnuts with butterscotch sauce. Stuff of dreams! We started off by making our own white sauces, left to our own devices with adding in our preferred amount of cheese (in my case probably a whole block) before adding in the mac and sour cream to ensure it was super creamy. Topped with bbq beef short rib, sour cream and coriander, it was out of this world kinds of great! Any mac n cheese left was scooped into balls, wrapped and smothered in breadcrumbs and fried. The sauce we made to dunk them in was a mix of cream cheese, coriander and chipotle paste. I managed to smuggle some of these home and had to fight for a share for lunchboxes the next day with the man friend. 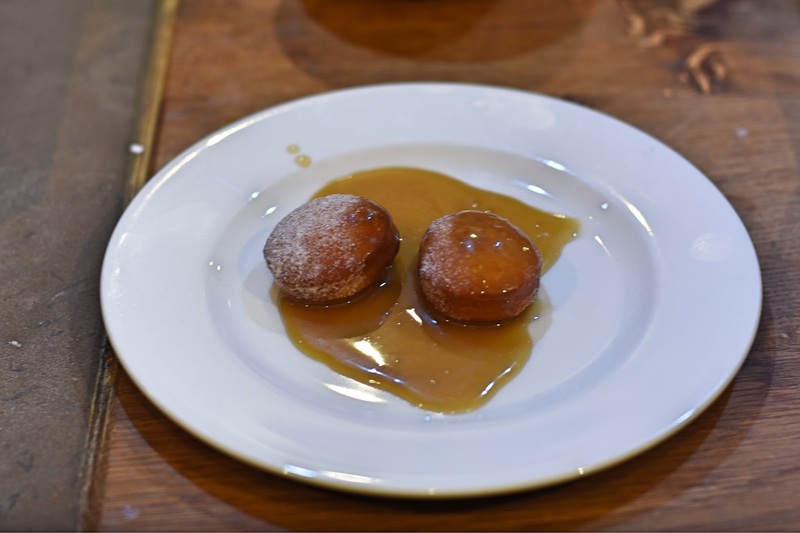 And of course, not forgetting dessert: the doughnuts with a super quick and simple butterscotch sauce. These tiny balls of wonder were deep fried, tossed in sugar and then smothered in butterscotch. You'll see my elegant shot of my 'small' serving, but in reality I ate closer to a plateful. No pressure in flipping the doughnuts in the fryer! Everything in each of the recipes was fully free from lactose, from the Lactofree butter and cream in the butterscotch sauce to the cheese and milk in the mac n cheese. So I suppose I ought to share a recipe. I'm super excited to make this mac n cheese over the weekend. I've never picked onions before and I absolutely love them and we've loads of beef in the freezer ready to roast away. Heat the oven to 160 degrees. Season the short ribs. Place in a roasting tray with the rest of the ingredients. Cover with foil and roast for 4 hours, until the meat falls off the bone. Add the pickled onion ingredients to a jar, cover with vinegar. Keep in the fridge till ready. Bring a large pan of salted water to the boil 20 minutes before the beef is ready. Cook the macaroni until just cooked. Drain thoroughly. 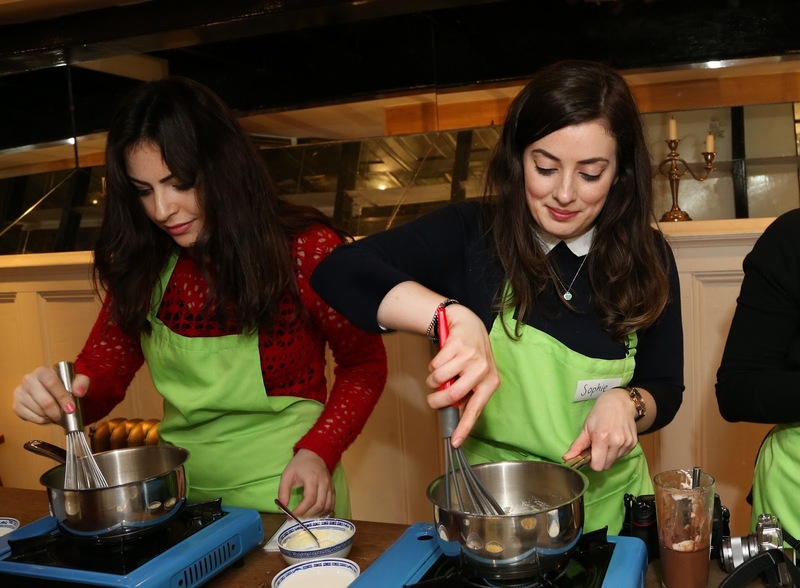 Melt the butter in a heavy bottomed pan over a low heat, add the flour and stir to make a paste. Cook for a few minutes, until it starts to turn golden. Slowly add the milk, continually whisking as you go. Cook for 5-8 minutes, until the sauce covers the back of a wooden spoon. Continue to cook on a low heat and add the cheese and mustard. Continue to mix until melted before adding the cooked macaroni and gently fold together. In a small bowl, combine all of the sour cream ingredients together. 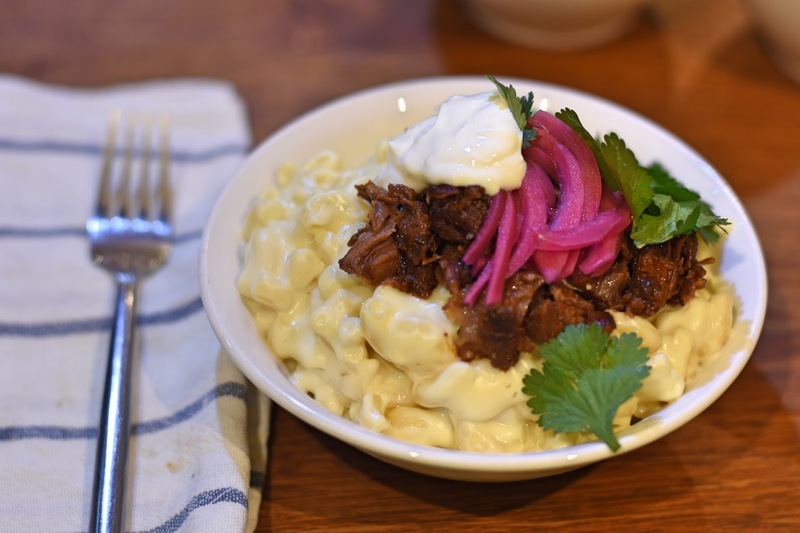 Transfer your mac n cheese to a serving bowl, top with short rib, pickled red onions and a big dollop of sour cream. Thank you to the Lactofree team for letting me loose with all the cheese and to Anna Mae's for all your mac wisdom. So excited to recreate! This sounds like my dream evening. I love lactofree (by far the best milk I've found) and mac'n'cheese is my all-time favourite food. Love the idea of the sour cream, definitely going to give that a go soon!